Infosys Limited (NYSE:INFY) is a tech company based in India, trading on NYSE, and it has found a huge bullish run of late. But even before that, there has been, for 3-straight years, a pattern of bullish momentum just four days before earnings that is remarkable. The company has earnings due out on 7-13-2018 before the market opens according to our data provider Wall Street Horizon, and four days before then would be Monday 7-9-2018 near the close of trading. It's that $20 level that is up next -- a point of technical resistance. 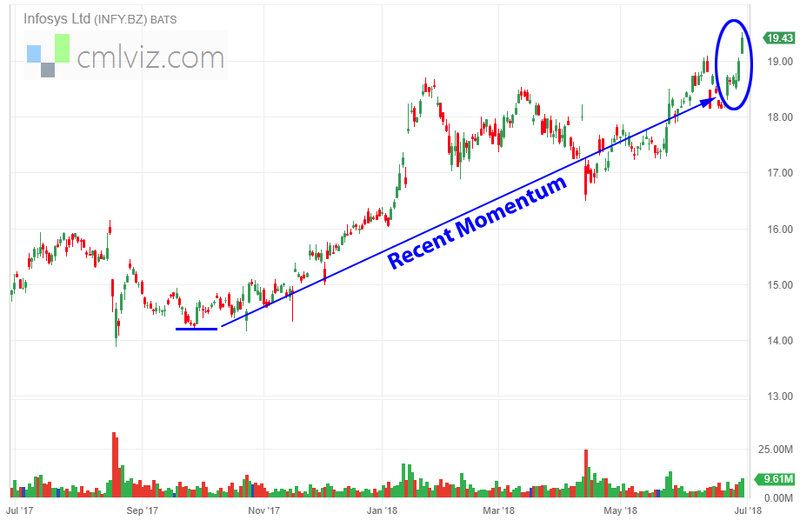 We will examine the outcome of going long a call option that is closest to one week from expiration in Infosys Limited just four trading days before earnings and selling the call one day before the actual news. We see a 275% return, testing this over the last 12 earnings dates in Infosys Limited. ➡ The average percent return per trade was 49.9% over each four-day period. We found this tech momentum pattern using the S&P 500 as our ticker group and then looking at the "3 Days Pre-earnings Log Call." We then tweaked the back-test just a bit to look at 4-days before earnings and saw those historical results were better. What's particularly interesting with this back-test is that the lion's share of the return has come from the last year. We're now looking at 262% returns, on 4 winning trades. ➡ The average percent return over the last year per trade was 65.3% over each four-day period.